This article was originally published in Global Trade Magazine on Dec. 1, 2017. It is not surprising to note the conclusion of the fifth round of NAFTA negotiations has left more than a few industries anxious. The negotiations, which hitherto had been a trilateral demonstration of mutual good will and diplomacy eroded quickly into unveiled attacks on the positions of each party to the beleaguered trade deal after the fourth round of negotiations. The impasse has led many observers to question whether or not the fate of the trade deal was already sealed; that the course had already been set for a US withdrawal. It is in such instances that corporations tend to begin scenario planning and risk analysis in an attempt to determine how their business will be affected and how to mitigate disruption. In many cases, they work with third-party organizations such as accountants, lawyers, actuaries and trade-services advisors, not to mention their existing suppliers, vendors, distributors and freight forwarders to determine how best to mitigate business disruption and loss of revenue. The challenge, however, is that the potential outcomes of the NAFTA negotiations may significantly alter long-standing trade rules and the degree and timing of those changes all remain speculative at this point. While it’s true the final outcome will either be a US withdrawal from NAFTA or a new, modernized trade agreement, how negotiators will arrive at either outcome offers a cornucopia of possibilities. 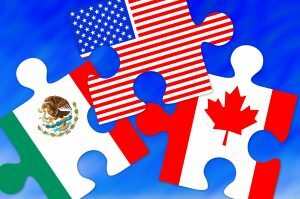 Unanimous approval: Assuming all parties agree to the terms of a new agreement by the recently revised negotiation deadline of spring 2018, a revised NAFTA could be implemented as early as the third quarter of 2018. Phased approach: In the event some of the parties offer concessions, they may find it politically (and economically) expedient to have these phased in over time. For example, in the unlikely event Canada were to concede a 50-percent US content requirement for automobiles, it may ask that this is something phased in over a period of five or 10 years (versus the current US proposal of a one-year phase in). This would allow companies to adjust gradually and would be less disruptive to their operations. Canada arranged a similar phasing in of tariff removals in its recently ratified free trade deal with the European Union.